Harstad is the fourth largest city here in Northern Norway and has a population of about 23,000. It is located on an island called HinnÃ¸ya and this island is the largest in Norway with it’s 2,204.7 kmÂ². 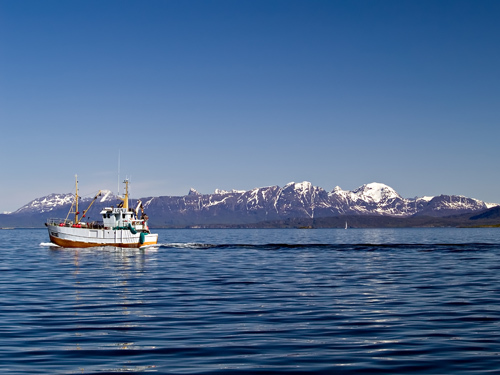 Harstad is often called “the pearl of VÃ¥gsfjorden” as the city lays by a beautiful fjord called VÃ¥gsfjorden. The scenery in VÃ¥gsfjorden is great for photographing with midnight sun during the summer and northern lights (aurora borealis) during the dark winter months. The combination of steep mountains and narrow fjords produce some of the most stunning scenery that I have ever seen. This scenery is simply perfect for a nature photographer like me. There are several other attractions beside the nature that one can check out in Harstad. One example are some huge guns called “The Adolf Guns” that was built during World War II by the occupying Germans. The Adolf Guns consists of the largest naval guns placed ashore in Europe during WWII and the whole gun battery is claimed to be Atlantic Wall’s largest and most powerful. One should also check out the beautiful Trondens Church. This old church was built around 1434 and is the northernmost Medieval stone church in Norway. For more information about Harstad you can visit the Wikipedia entry about the town and the official travel website for Harstad. If you want to travel to Harstad and are looking for a good hotel you can check out this website where most of the hotels in Harstad are listed. When I grew up Harstad was the closest city to where I used to live and we used to simply call it “The city” as it was the only city we ever visited. Here is a picture taken from the harbor in Harstad with a view over VÃ¥gsfjorden and with the island I live on (AndÃ¸rja) in the background. 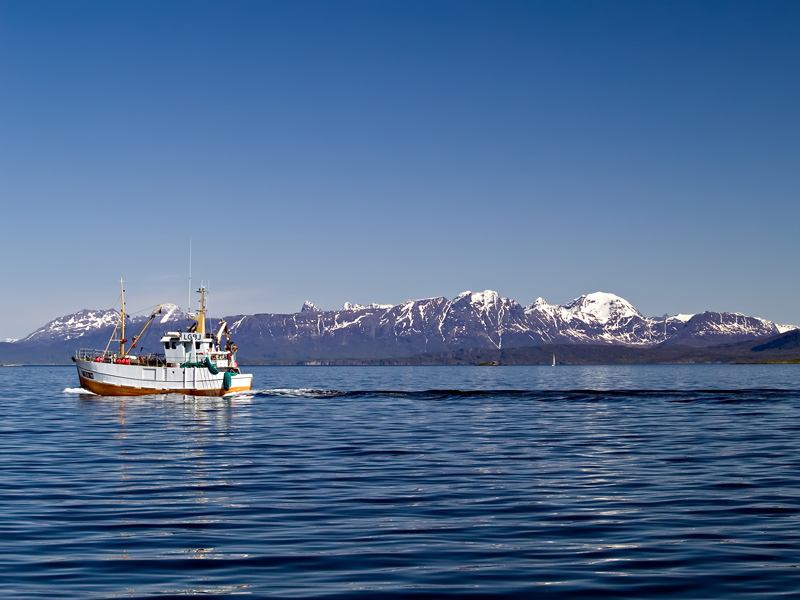 The boat pictured is an old fishing boat called “sjark” that are still commonly used in the fisheries here in Northern Norway. Lofoten is one of the most beautiful parts of Norway, and this says a lot. You should visit some time. Anoter fine image from you, Thomas!